There were a few different kinds of apples just sitting in my refrigerator. And with some down time and an urge for something sweet, I thought, let’s see what I can make with these. After searching the web for about 45 minutes, looking at various recipes, I decided to wing it. The worst that could happen is an awful tasting mess that I would unceremoniously toss. The best? Heaven with a cup of tea! The best apple cake I ever had used applesauce, so I started there. Applesauce, IMHO, should never be bought, only made at home. It’s so easy and you can control just how sweet it is because you can add as little or as much sugar as you wish. I put the pan on the stove and turned up the heat to medium, using a big wooden spoon to toss them around a bit. About 10 minutes into it, I added about 1/2 cup of water…just to keep them from getting too sticky while they continued to cook down. 10 minutes later, after mashing down the softened apples, I had a delicious homemade applesauce. Then I simply mixed the contents of the two bowls together. With a few tosses of the spatula, it looked like oatmeal! I mixed that up with my hands to form a nice crumbly topping and spread that on top of the cake mixture. Into the oven at 350 for 40 minutes it went. The intoxicating scent of apples and cinnamon — mmmmm…. so good! And with a cup of tea, a slice of heaven appeared on our plates. Just like that. That leftover turkey that we didn’t eat on Friday because we had enough on Thursday and didn’t want to look at it again, was looking right at me when I opened up the fridge looking for lunch. No, I didn’t want to head back to the store. Not for the nth time this week. Mashed potatoes & ricotta with shaved parmesan an egg, salt and flour make a lovely gnocchi dough. Dumplings would be lovely on a grey day like today. I mixed it up in a bowl. It’s a sticky, wet dough. I decided not to get fussy. I just wanted to eat, not win a pasta making contest. So I rolled it out onto a tray that I had covered in a dusting of flour. From there, I created ropes with my hands and then and cut off little pillow shapes approximately the same size and shape. To cook them, I added them to a big pot of boiling, salted water and waited for them to float. That was all there was to it. When they were all cooked I added them to a dish that I could put into the oven. Even dogs sleep after turkey. I took my leftover turkey and shredded it by hand, adding it to the dish and giving Ozzie (the very patient dog, sitting at my feet, staring up at me, intently with those beautiful brown eyes) what I didn’t want to put in the casserole. Rummaging further in the freezer, I found a 1/2 a bag of frozen peas — so I threw that in. I was looking for the classic Turkey Tettrazini cheat — Cream of Mushroom Soup — but we don’t have that in the house. However, I did find — way in the back — a can of some Broccoli Cheese soup that I must have purchased for some recipe and never used. Carpe diem?! I poured that into the pot right over the dumplings and shredded turkey and peas and added a little left over cream (from the mashed potatoes earlier in the week.) Popped it into the oven at 400 degrees while I cleaned up the dishes. It took about a half hour to get all hot and bubbly. It came out smelling divine. I shredded a little bit of fresh parma on top and served it for lunch. The verdict? My son, who loves to eat around the vegetables even at 15 — ate the whole thing. Almost licked the bowl! My daughter, the vegetarian — ate some unadorned gnocchi/dumplings that I left on the side with a little vegan butter and shredded parm. Not bad for a Saturday leftover riff, eh? I’m calling it the “Turkey Trot” but you can call it delicious. Bisquick + eggs + sausage + cheese + scallions + mushrooms. AMAZING. Delicious? Simple to make? Transportable in a napkin? Yes, yes, and OH YES! You don’t need pictures to know how to make this. It’s THAT easy. 2. Take 4 eggs and crack them into a bowl. 3. Add 1 cup of Bisquick. That’s the basic recipe. Now you start riffing by adding what you like. Mine was pretty darned good so I’ll share my concoction. I took a few (6) sausage links and cooked them in my frying pan until they were no longer frozen and a little browned. (I used the vegan option as my daughter, Jules won’t touch pork anymore!) When they were done, I chopped them up into little pieces and added them to my batter. Next, I put a little swirl of EVOO into that pan and added some chopped oyster mushrooms & scallions. Lately, I am in love with oyster mushrooms as they have that meaty, mushroomy flavor that white buttons don’t ever have. But I would eat any mushroom that crossed my path! I grated about 1/4-1/2 cup of cheddar cheese into the batter. Then added a pinch of kosher salt. 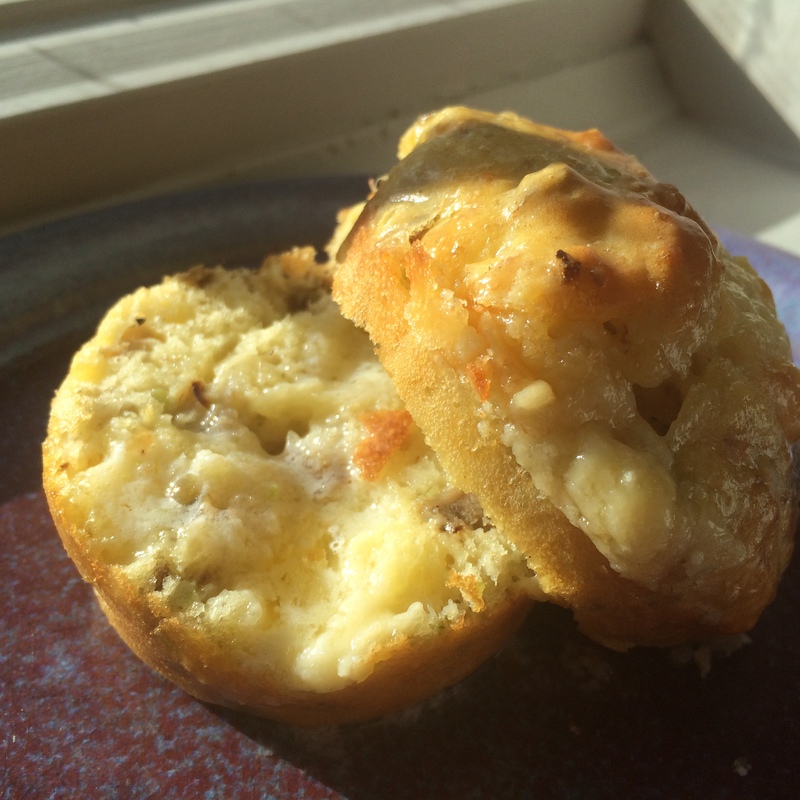 Two on your plate with a cup of hot joe and — voila! You have made a delicious, easy breakfast that your husband and son can grab in a napkin and take on the way to father/son bowling on a Sunday morning. Watching Anthony Bourdain in Paraguay — want to make this soup! My son is a big laddu fan. So much so that I have gained expertise in turning anything into the laddu-ball shape to entice him to eat it. Typical paruppu-saadam urundai (small balls of dal/lentil and rice) are passé. Fruit balls made with the melon baller, cooked vegetables and rice balls, pulao balls (yes, I’ve made those too! 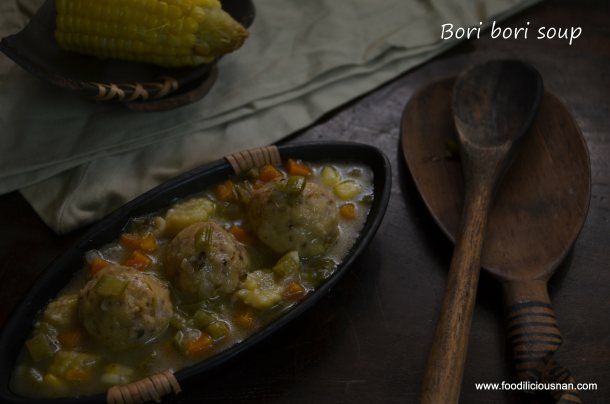 ), milk and biscuit balls (those were before he started eating ‘bikki’), roti-sabzi balls – you name it, and I’ve made it all! Funnily enough, you know how he eats the actual boondi laddu? He crumbles the entire laddu, smashes it up even more and then puts each tiny bit by tiny bit into his mouth! Bought tofu, pressed it for two hours last night and soaked it overnight in a Teriyaki Ginger Sauce… following this recipe. Will take some pictures and share if we like it! Baked Tofu & Quinoa with Chickpeas and Spinach — Koko Likes. via Baked Tofu & Quinoa with Chickpeas and Spinach — Koko Likes. What is the difference between a peach and a nectarine? Fuzz! Yes, it’s true. A nectarine is a peach that through a genetic mutation produces no “hair” or fuzz. 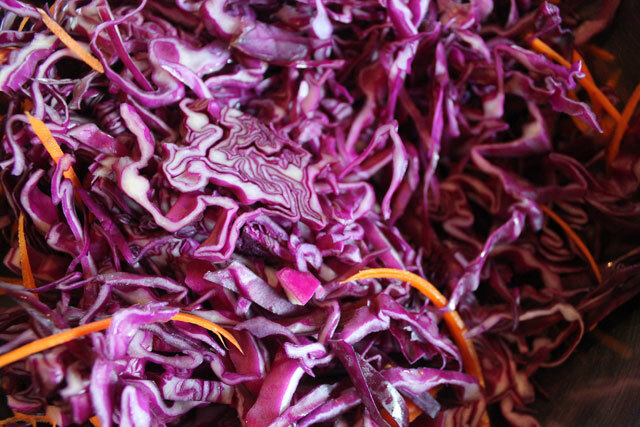 Smooth skin, juicy, sweet flesh and no fuzz…what’s not to love? I was feeling the love when I saw them at Wegmans and put a bag in my cart with the full intent of eating them one at a time. But despite the beautiful golden orange appearance — and the words on the bag “ready to eat” — the flesh felt hard when pressed and I couldn’t catch a whiff of the fruit so I knew they weren’t quite ripe. I put them into a paper bag and let them sit for a few days on the counter until I smelled the sweet scent so recognizable at its peak softness. I took a bite. It was juicy, but not as sweet as I would have liked. 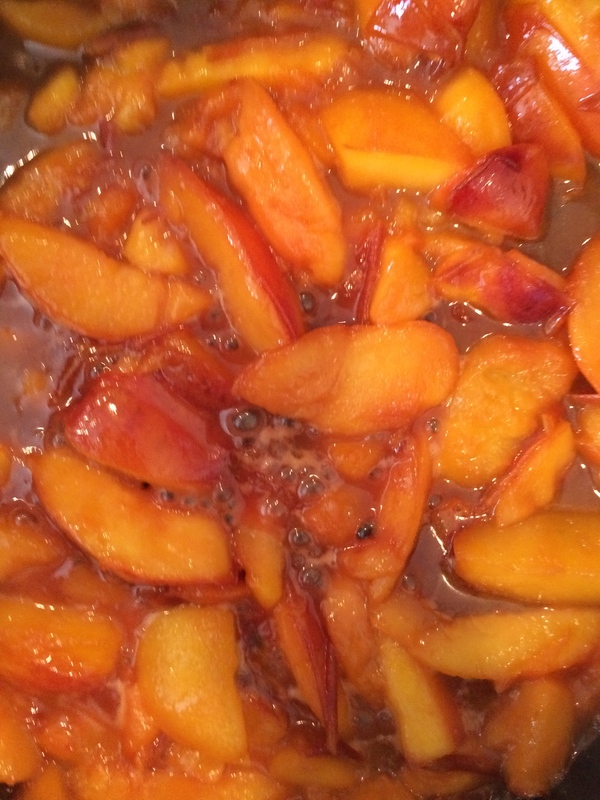 brown sugar, butter, pinch of salt and sliced nectarines… yum! I put a few tablespoons of butter, brown sugar, and a pinch salt at the bottom of a skillet — and as that heated and melted, I cut up 6 nectarines into thin slices right into the pan. I turned the heat down to low and added a lid and let the fruit cook down into a sweet, juicy filling. Pankcakes? Waffles? Both are delicious, but I wanted something lighter. So I made crêpes. Crepes might seem a little intimidating but I think once you get the hang of them, they are fairly easy to make. Alton Brown has a great recipe on his site, so does my bible — Joy of Cooking. Blend away, stopping to scrape the sides of the blender where flour may stick. It takes no more than 2-3 minutes to get it smooth. When you are done, stick it in the refrigerator for a half-hour to rest. Take out a small skillet and add a little fat. I often take veggie oil and melt in a tablespoon or two of butter. Then I use a basting brush and brush the bottom of my non-stick pan with the mixture before I put in some batter and swirl it around. 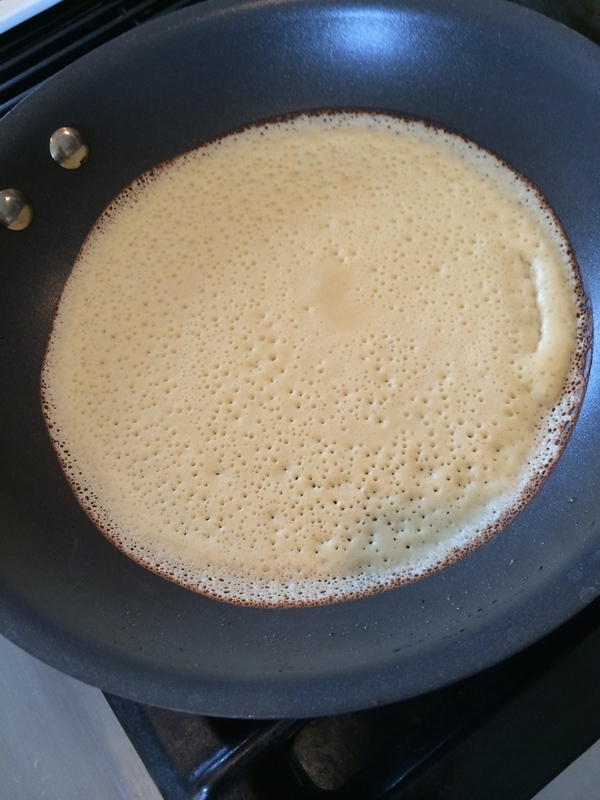 Crepes are meant to be very thin and very light so you don’t want to have too much batter in the pan. You really have to experiment. This video shows you exactly how to make them. I filled mine them with a little french vanilla yogurt on the bottom and the cooked nectarines inside. You can dust them with powdered sugar to give them a little extra oomph! Ever wake up with just one thing on your mind? It was like that with me one morning. I had an urge for fresh coffee and a pastry of some sort. I didn’t feel like going to the store so I looked at Joy of Cooking and saw a recipe for Cream Biscuits. I had just purchased a large container of strawberries and while I was eyeballing them in the open fridge — a thought popped into my mind. What if I combined them? What did I do to change it up? I followed the basic recipe but I added a teaspoon of vanilla. (Actually, vanilla bean paste. It is thick and smells awesome and leaves little vanilla bean speckles in whatever you make. The taste is simply divine!) Then, about 1/3 cup white sugar to the mix. 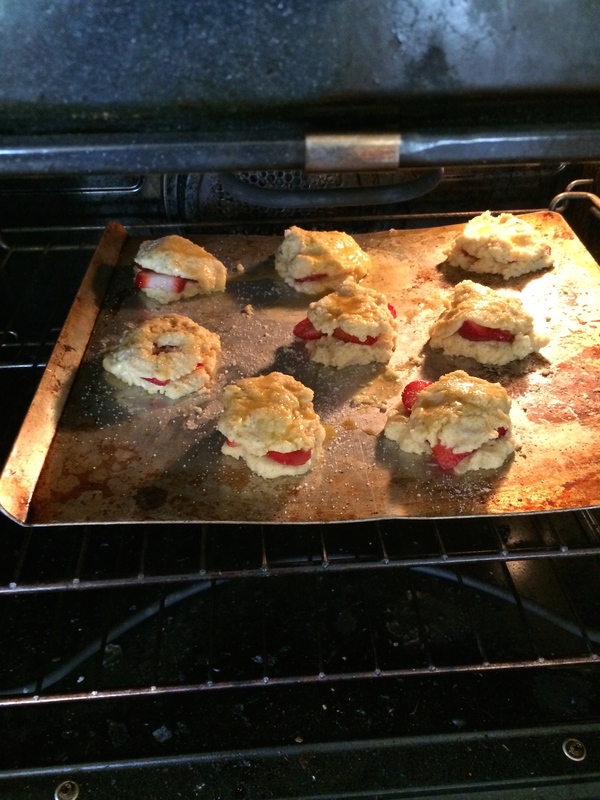 I splashed in a little extra cream while mixing the dough so that I could work more easily to shape the biscuits. 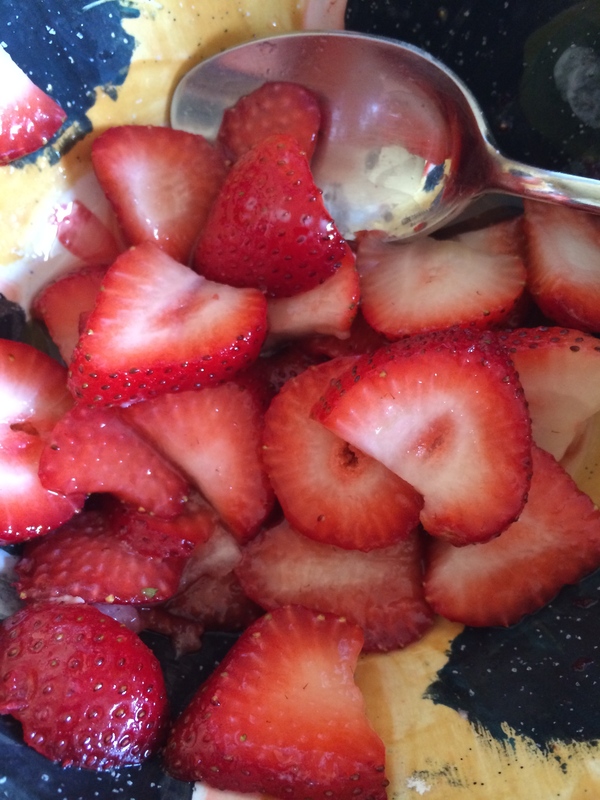 I cut them in half, horizontally and snuck in a layer of sugared strawberries. I painted the top of the biscuits with a little egg white and sprinkled on a tiny bit of sugar. Finally, I baked them! Sliced and sugared, they macerate in their own juices. 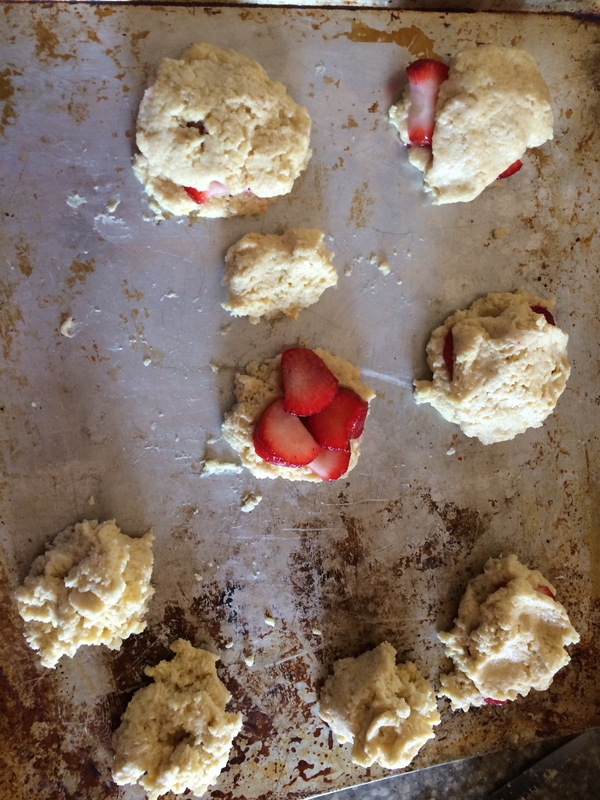 Split the biscuits and add a layer of sugared strawberries. Anywho… just a quick spray of olive oil in the pan, and a handful of spinach and a touch of salt made a delicious green addition to my omelet. And at the last minute, I spied a tomato that made it’s way into the pan as well. All those colors of the rainbow in one pan looked so good…and tasted pretty darned good too as I washed it down with coffee. 1. Pan on medium, spray a little olive oil and add a tidge or smidge of butter in it and let it warm for a two minutes. 2. Crack two eggs into a bowl. Take out the white stringy things if they annoy you like they do me. 4. Add to pan and roll around to cover the bottom. 6. 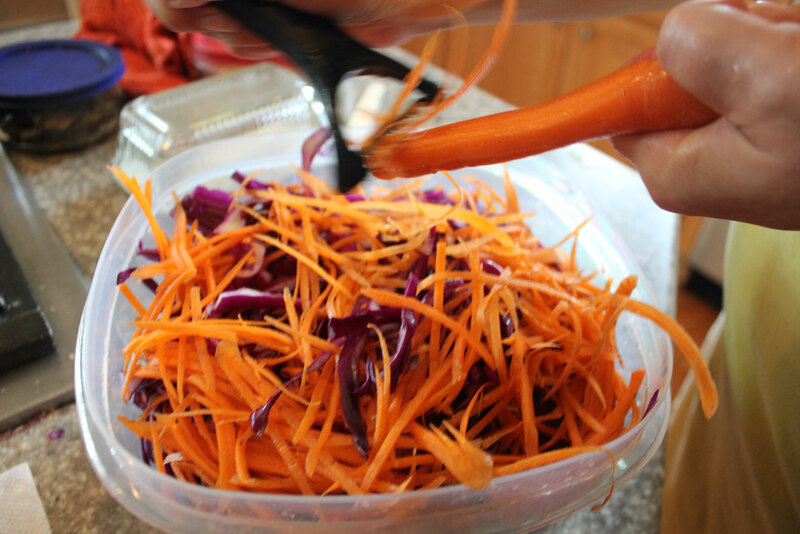 Riff away with anything you have in your fridge that looks appetizing. 7. When the egg appears firm on the bottom, fold one half over to make a taco-like semi-circle. 9. Remove from heat. Slide onto dish. 10. Pour coffee, grab toast, kick the cat off your chair and sit down and eat.